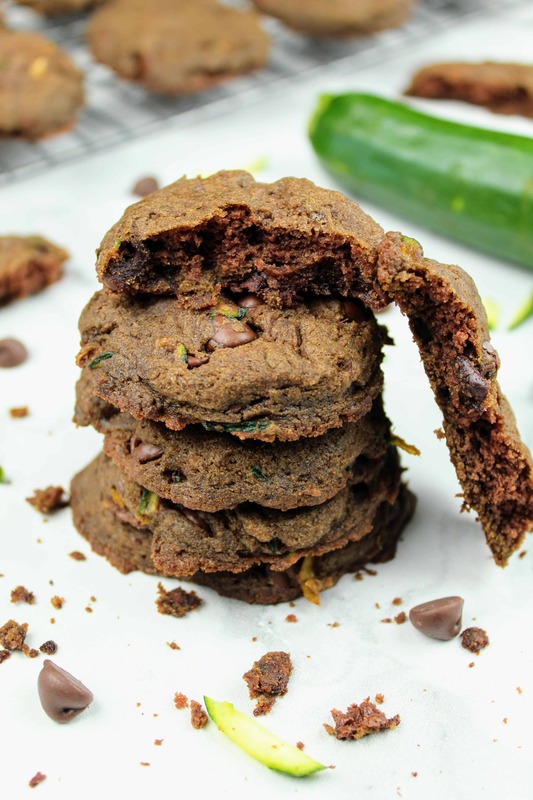 These vegan double chocolate zucchini cookies are, hands down, my favorite cookie. I make these ALL THE TIME. I stumbled across the original recipe from Boys Ahoy a few years ago, and I just had to make them. 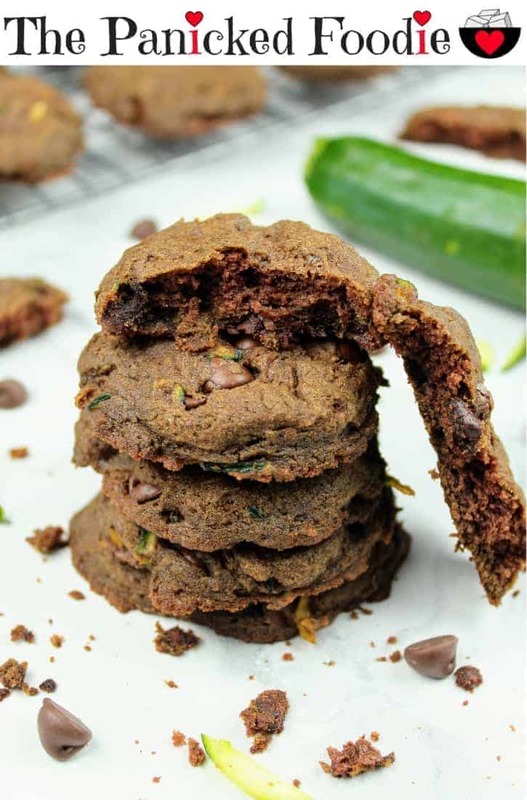 Not only is it a good way to use up zucchini (I suppose I could’ve used it in a healthier way… ;)), but the cookies themselves are so airy and moist, that you would swear you were eating a slice of chocolate cake. When I first bit into a cookie, I literally could not believe the texture. They are little bits of heaven, stuffed into a cookie. Using the original recipe from Boys Ahoy, I veganized it and made them gluten-free. Because gluten-free flour is much denser than regular all-purpose flour, I had to try this recipe a few times to get the amount of gluten-free flour right to perfectly mimic the airy and moist texture. Needless to say, I think I achieved it! Can you use gluten free flour in place of regular flour? Yes, but there are some things to be aware of. A cup of regular all-purpose flour typically weighs around 4.25 oz/cup. Gluten-free 1:1 baking flour, like bob’s red mill, clocks in at around 5.0-5.1 oz/cup. This means that the gluten-free flour is a lot denser, and that could be important. If you substitute 1:1, you usually end up with a product that is too gummy and heavy. I have been doing a lot of experimenting with this, and it helps to undercut the flour a little bit. I usually aim for 4.7-4.8 oz/cup. I haven’t tried anything lower than that yet. Another thing I noticed, is that gluten-free flour can be a little gritty in some cookies more than others. Because of this, I would recommend against using flax eggs as the binder. 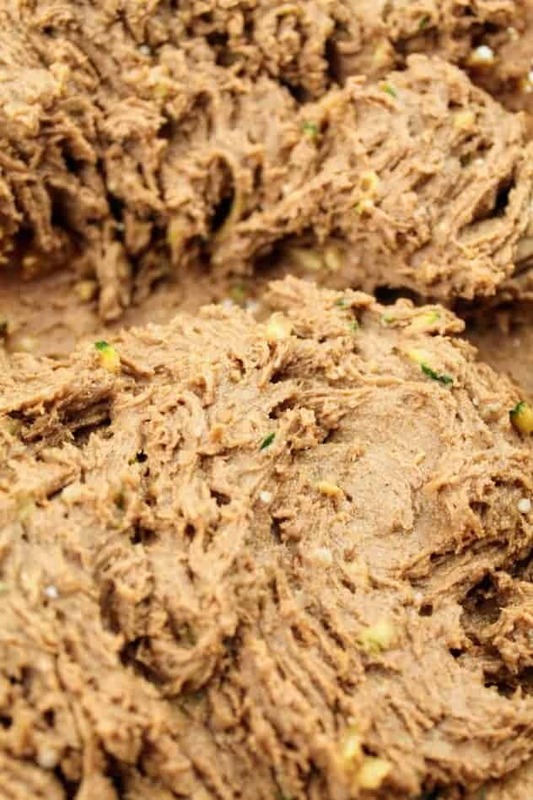 The last important thing is to make sure to really beat the dough with a Kitchen Aid mixer or an electric mixer to aerate the dough and provide it some lift. How does gluten free flour affect baking? The biggest thing, is that it can lead to really dense and gummy baked goods if you aren’t careful with how much you add. With gluten-free flour, it is important to weigh it out. Because of this, it can be harder (but not impossible!) to achieve baked goods that are light and airy. Can I use frozen grated zucchini? Yes! I haven’t tried this yet, but it should be fine. The only thing to watch out for, is the zucchini will be wet and mushy after it’s dethawed. So, a cup of thawed frozen grated zucchini is going to pack much more densely than freshly grated zucchini. Because of this, I would start by adding in 1/2 cup. If you would like more zucchini, then add in another 1/4 cup. To prep the frozen grated zucchini, I would rinse it under warm water to quickly thaw it out and then make sure to use a towel and squeeze out the excess water. 1. Preheat oven to 375F. Grease baking sheet (I used Crisco). 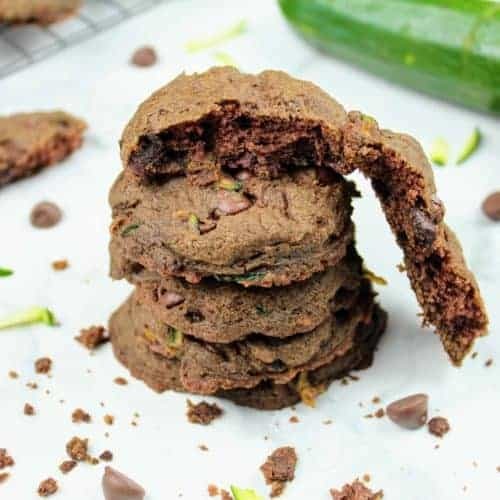 In a large bowl, mix zucchini, light brown sugar, coconut oil, vegan butter, applesauce, vanilla extract, cinnamon, baking soda, cocoa powder, and Kosher salt with an electric mixer until just combined. 2. Add in the flour, ~1 cup at a time mixing after each addition. Using an electric mixture, beat the dough on high for a minute or two to aerate. To make sure you don’t add too much flour, it’s best to weigh out the flour as opposed to measuring it out by volume. If you are using gluten free 1:1 baking flour (such as Bob’s Red Mill), aim for 4.7 oz/cup. If you don’t have a scale, this is about 15 tablespoons (for reference, 1 cup is 16 tablespoons). If you are using regular all-purpose flour, then each cup should weigh 4.25 oz. 4. Use a tablespoon cookie scoop to scoop mixture onto baking sheet. With your fingers, lightly press the cookies down to flatten them. Bake for 7-9 minutes. These cookies are my absolute FAVORITE. They are soft and fluffy, like a slice of chocolate cake! Serve with a cold glass of your favorite milk alternative. Preheat oven to 375F. Grease baking sheet (I used Crisco). 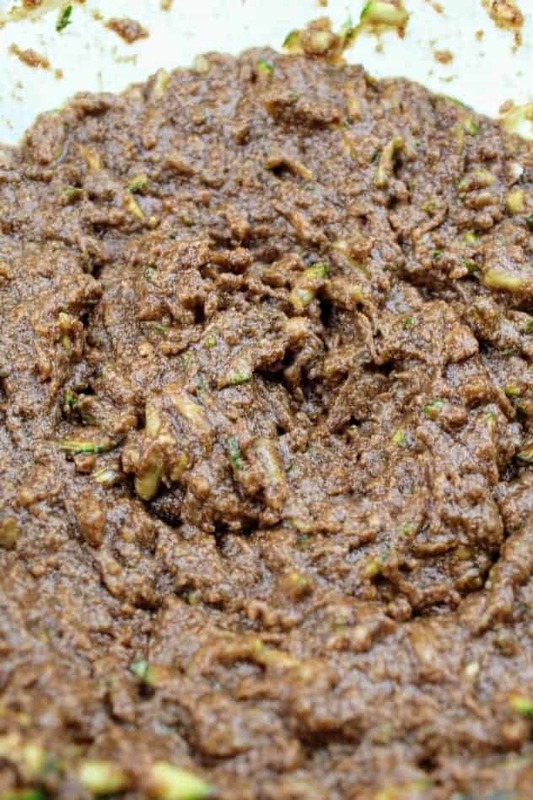 In a large bowl, mix zucchini, light brown sugar, coconut oil, vegan butter, applesauce, vanilla extract, cinnamon, baking soda, cocoa powder, and Kosher salt with an electric mixer until just combined. Add in the flour, ~1 cup at a time mixing after each addition. Using an electric mixture, beat the dough on high for a minute or two to aerate. 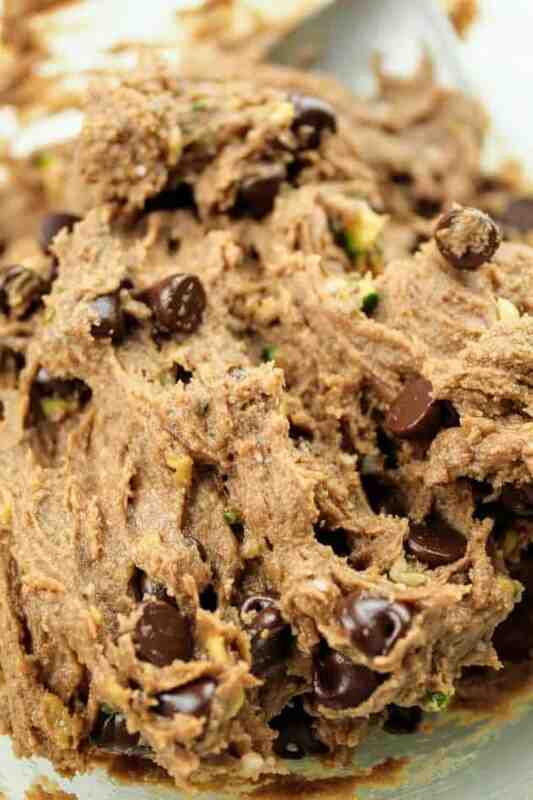 Use a tablespoon cookie scoop to scoop mixture onto baking sheet. With your fingers, lightly press the cookies down to flatten them. Bake for 7-9 minutes. 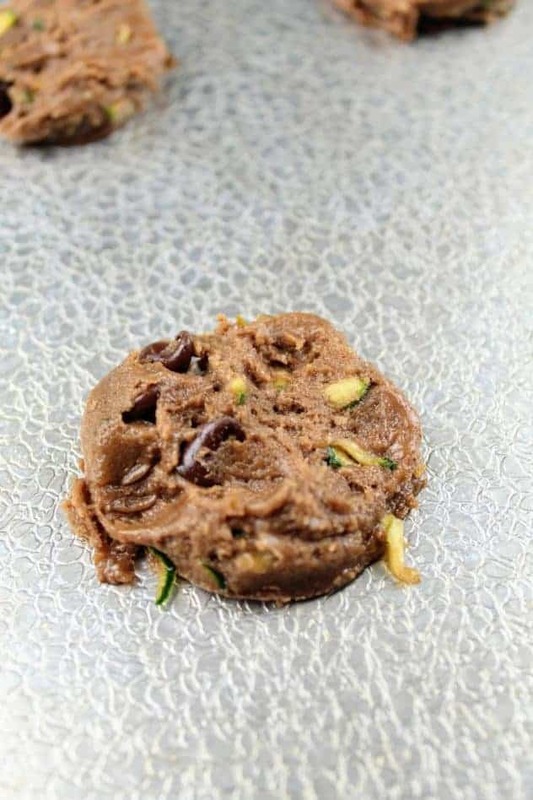 Whenever I make any zucchini cookie, I generally grate the entire zucchini, use what I need, and then store leftovers in the freezer for future use. Credit: Recipe adapted from Boys Ahoy. I have never tried making cooking with zucchini in them. This looks like a good recipe to try and a perfect way to “hide” veggies from a picky eater. I will try your recipe and send some to my sister. Her kids are really picky eaters! I am definitely going to try these! You’ve got all my loves right here! Coconut Oil, chocolate, and COOKIES! You can’t go wrong with this. 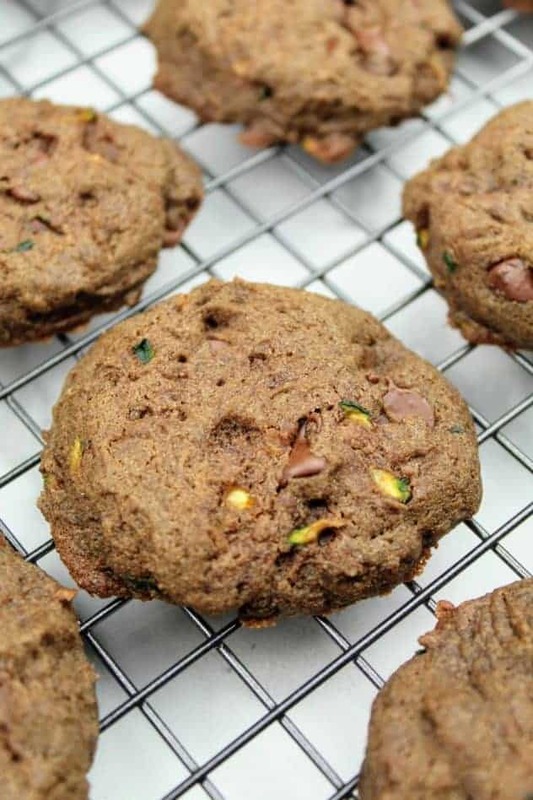 Adding zucchini makes them so moist – but I’ve never tried baking with the coconut oil. Can’t wait to try! This looks fabulous and healthy. Love the coconut oil addition. I love chocolate cookies in general. However two ingredients that you have used in your recipe have excited me into wanting to try your version. Those are the Zuccini’s and the coconut oil. I love both these foods and the description in the recipe is super interesting. Great looking recipe! Yup, i’m defenitly one of those adults that needs tricking into eating their vegetables. As a life long veggie hater, I have to say those look amazing! Thanks for sharing, and will probably try them out! What a great cookie recipe! I would never have thought of combining these ingredients. I really must try them. I love the sound of this recipe. It would be so delicious. I will be trying my hands on this once I am chanced. This looks so delicious and yummy. I also think this was a genius use of coconut oil.